A delightful, whimsical tale—one of the most popular books for cat lovers ever written, now newly illustrated. May Sarton's fictionalized account of her cat Tom Jones's life and adventures prior to making the author's acquaintance begins with a fiercely independent, nameless street cat who follows the ten commandments of the Gentleman Cat—including "A Gentleman Cat allows no constraint of his person, not even loving constraint." But after several years of roaming, Tom has grown tired of his vagabond lifestyle, and he concludes that there might be some appeal after all in giving up the freedom of street life for a loving home. It will take just the right human companion, however, to make his transformation from Cat About Town to genuine Fur Person possible. Sarton's book is one of the most beloved stories ever written about the joys and tribulations inherent in sharing one's life with a cat. 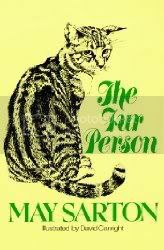 The Fur Person is a book that I think any cat lover will cherish. I reread it every couple of years and can always see so much of my cats in Tom Jones (even though my cats are girls). We follow Tom Jones on his journey from a Cat About Town to his discovery of a loving family, and his evolution with his new family, Brusque Voice (May Sarton) and Gentle Voice (Judy Matlack), from Gentleman Cat into a Fur Person. I would imagine that May Sarton took some literary freedom in relating Tom's early years before he became part of her and Judy's family, but his time with them is based on his true adventures. It's a charming little story that I think any cat lover can relate to.